Why do we need AEDs in camps or at schools? What is the scoop on AEDs and Sudden Cardiac Arrest? We are talking about the nation’s leading killer; killing more people than strokes, AIDS and breast cancer in the US annually. Each year, between 300,000 and 400,000 Americans experience sudden cardiac arrest (SCA) outside of a hospital. About 10,000 to 20,000 are children! SCA affects people of all ages! On average in the U.S., just 6.4% of SCA victims survive. Cardiopulmonary resuscitation (CPR) and early defibrillation with an automated external defibrillator (AED) take chances of survival to over 65%. In fact, early defibrillation (within 2-4 minutes ideally) with CPR is the only way to restore the SCA victim’s heart rhythm to normal. For every minute that passes without CPR and defibrillation, the chances of survival decrease by around 10%. However, there are not enough AEDs to provide this life-saving treatment, resulting in lost opportunities to save more lives. Tragically, per a NIH study in 2007, 64% of Americans have never even seen an AED. AED PROGRAMS CAN AND DO IMPROVE SURVIVAL RATES. 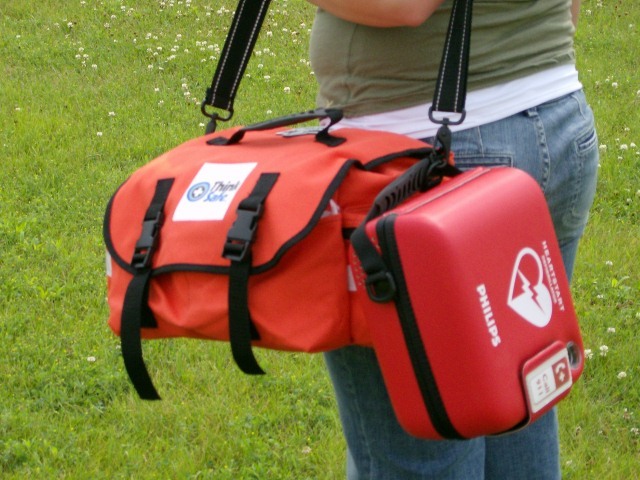 Communities with comprehensive AED programs that include training of anticipated rescuers in both CPR and AED use have achieved survival rates of 65 percent or higher. Illinois in 2009 passed an AED law for “recreational areas” that includes sports fields or recreational areas, affecting schools and camps. Also, organizations that are involved in camping – such as the YMCAs, Boy Scouts or Girl Scouts have been placing AEDs in an increasing number of facilities and camps. This is setting an expectation to provide care amongst the population and camp attendees. With AEDs becoming more readily available, the potential exists for increased litigation from not having an AED on premises if there is a SCA event at the camp facilities. With AED prices dropping, more products to choose from, and the possible consequences of living in our litigious society, the time for a camp to purchase an AED is now. This is especially true of those camps in remote areas where medical response is delayed. Why should I be a champion for AEDs? Can’t we just call 911? The national average for EMS response in the US is 8-10 minutes. It is recommended (for best chances of survival) AEDs be used early on and ideally within 2-4 minutes. There is a very good chance emergency medical services (EMS) cannot respond fast enough to save someone in cardiac arrest, particularly in congested urban areas, high-rise buildings, in remote rural areas, or large facilities. What constitutes gross negligence isn’t spelled out in the law. Per product liability attorneys specializing in AED case law, organizations that have heavy traffic are more at risk if they fail to comply with “standards to provide care” and don’t have an AED at all. Any manager or camp director at any large or high traffic facility should consider ramifications of not having at least one on premises in the event of Sudden Cardiac Arrest (SCA). It is most likely their own job they are putting on the line and they should argue hard for them. As a value-add for those directors whom can’t get top down management on board and funding is an obstacle; they should get hard copy evidence on file from their management if they can not get approval for purchase. The old “CYA” policy! Think Safe can help your organization with AED funding and placement assistance. Complete the form below to have a representative from our AED GRANT DEPARTMENT contact you. 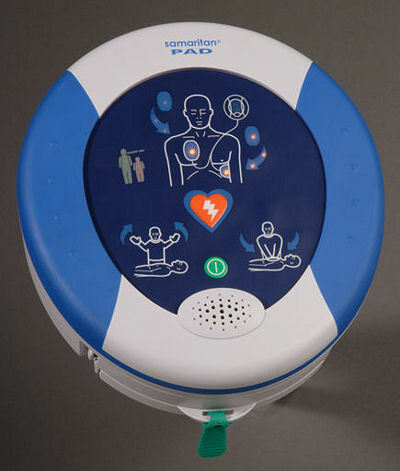 We are here to help you and to provide you more information and best pricing or match funding for your AED purchase needs. In the previous blog post we spoke about determining the level of risk at your facility and if your facility was at higher risk for having a SCA (Sudden Cardiac Arrest) event. We also provided a list of higher risk facilities. 1) Is it unlikely that the existing EMS system would be able to reliably achieve a “call- to-shock” interval of five minutes or less at this site? 2) Has an SCA incident occurred at this site in the past five years and have the demographics of the population served by this site remained relatively constant? 3) Do 10,000 or more persons regularly gather at this location? 4) Does this site have a large concentration of persons over 50 years old? A. Take the number of individuals at your location and multiply this number by the % of people age 50 or over. B. Multiply this number by the average number of hours spent at the location each day. C. Multiply this number by 350 if the location is residential or 250 if the location is non-residential. D. If your answer is 600,000 or higher, your location has a high probability of SCA. If you answered YES to any of the above questions you are at higher risk of having an SCA event and you need to talk to our technical experts or a local rep. Think Safe can provide a full AED Site Assessment Survey for your use and one of our local representatives would be happy to perform on onsite AED placement assessment. Think Safe’s First Voice product line includes a full line of AEDs and AED accessories. From low cost and rugged solutions our product catalog has what you need to put in place an effective and protective AED program. Due to the number of deaths every year and SCA events that occur, we like it when people appear to be educated that it is only a matter of time – at some point we are all likely to experience or witness a SCA event. Again, we are talking about the nation’s biggest killer; affecting over 300,000 people in the US annually and killing more people than all forms of cancer combined! The following information might provide you some helpful insight to determining your levels of risk. What are the most likely places to have SCA events occur? Some studies have shown a higher incidence in certain locations, listed below. Watch for our next blog post on AED Site Risk Assessment for key questions to ask. For more information about how to assess your risk, contact us at 888-473-1777 or complete the form below. We can provide you a complimentary (NO CHARGE) AED site risk assessment survey. If you would like, we can send a local rep to your facility for a NO CHARGE placement assessment as well. You are currently browsing the Think Safe Blog blog archives for June, 2010.